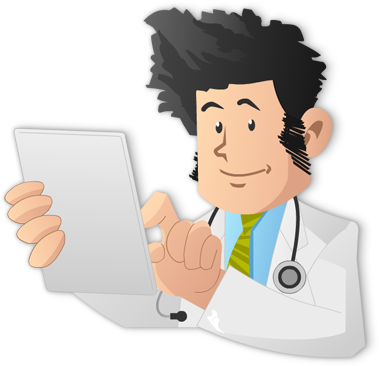 Dermatology is an important topic to grasp for the Internal Medicine Board (ABIM) Exam. Here is a dermatology question with an attached image. 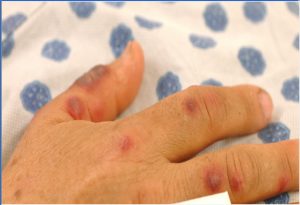 45 year old male with 1 month of fevers, chills, and fatigue presents with panctyopenia and the following skin lesions. He notes a new lesion at the site of a recent IV stick. Biopsy of the skin lesions shows sheets of neutrophils in the dermis. Which of the following malignancies is MOST likely associated with this condition? This patient presents with Sweet’s syndrome, or acute febrile neutrophilic dermatosis. The clinical presentation is of erythematous to violaceous papules and nodules typically over the arms, legs, and neck. These can develop a bullous, pustular, or pseudovesiculated appearance. These lesions classically demonstrate pathergy, or development at sites of trauma. Sweet’s syndrome is associated with AML in 20% of cases; the remainder are idiopathic or associated with other leukemia, drugs (G-CSF, ATRA), or infections (Strep, Yersinia). Sweet’s is rarely associated with solid tumors, such as GU, GI, and breast cancer. Treatment is of the underlying disorder; idiopathic cases usually respond well to prednisone. You can see all the previous ABIM Exam image of the week blog posts at the Knowmedge Blog. You can also find additional topics and questions directly from the Knowmedge Internal Medicine ABIM Board Exam Review Questions QVault.